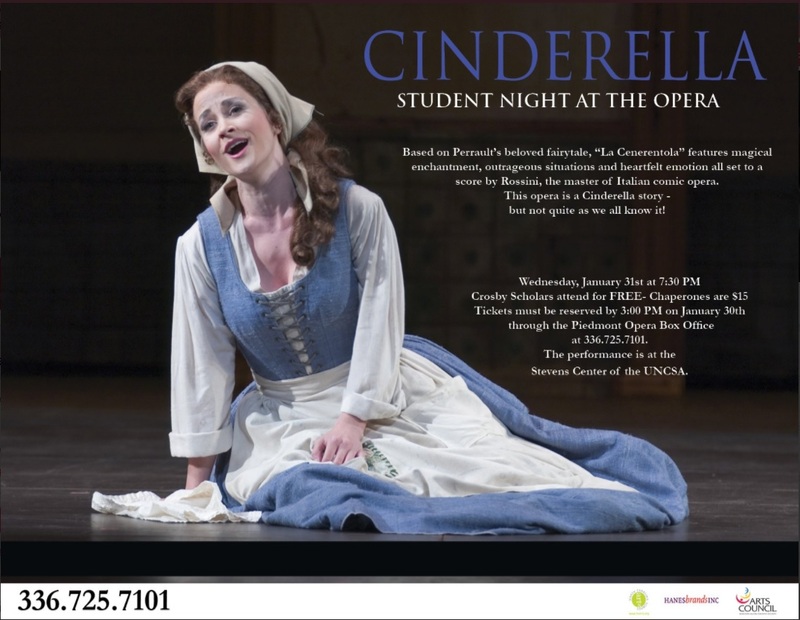 Piedmont Opera and the Crosby Scholars Program are pleased to offer scholars free tickets to the performance ofLa Cenerentola on Wed., January 31 at 7:30 p.m. (Student Night). Accompanying parent/guardian ticket price is $15.00 on Wednesday. Tickets must be reserved by Tues, January 30 at 3 p.m.
To reserve a ticket, please call the Stevens Center box office at 336-725-7101. Gioachino Rossini’s take on the classic fairy tale, Cinderella, his opera, La Cenerentola, is considered to be one of his greatest operatic achievements. The opera premiered on January 25, 1817, at the Teatro Valle in Rome, Italy and is set in late 18th century Italy. **A drawing will be held for one $250.00 scholarship awarded to a junior or senior Crosby Scholar student who attends the performance.This scholarship must be applied toward the winner’s college education, and the recipient must graduate from the Crosby Scholars Program. While Crosby Scholars staff will be in attendance, due to the nature of the event, we regret that we are unable to be responsible for supervising students before, during, or after the opera. Parents/guardians should make appropriate arrangements for supervision and transportation of their students for this event. If you have any questions, please contact our office at 336-725-5371.